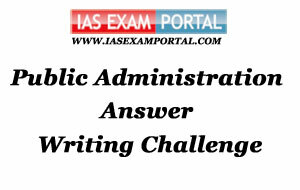 Weekly Mains Exam 2016 Answer Writing Challenge - Public Administration "MODULE- 51" | IAS EXAM PORTAL - India's Largest Community for UPSC Exam Aspirants. Weekly Mains Exam 2016 Answer Writing Challenge - Public Administration "MODULE- 51"
Public Administration- Paper I "Syllabus Topic – Organisations: Boards and Commissions"
Q1. "Boards and Commissions have their obvious advantages ,yet due caution must be excercised in setting up bodies headed by plural chief executives. comment"
If administrative authority within a department is vested in a single individual, it is called a ‘bureau ‘ system. It is this system which is usually followed in government departments.If administrative authority within a department is vested in a plural body, it is called a ‘Board’ or ‘Commission’ system. Willoughby has laid down the following criteria for deciding which system is to be used and when. 1) “ As a canon of correct administrative practice it may be laid down that when the work to be done is essentially of an administrative character, the bureau system should be followed” this is so because the efficient operation of administrative activity requires unity of command, quickness in decision and promptness in performance. All these is possible only when authority is vested in a single individual . 2) “ where the duties to be performed involve the exercise of discretion on an important scale in the formulation and adoption of policies( such as, drafting of rules and regulation affecting private citizens), and in the adjudication of claims, the board or commission system should be adopted”. A board may be also advisory, when it is attached to the head of a Department. E.g., Several advisory boards in the ministry of Industry and Commerce.The Board type of organization is specially advantageous where policies and techniques to be followed by the departments are not yet fully settled and deliberations and discussions are necessary to discover the right course of action to be followed. In this cases a plural headship is preferable. Commission means where the intention is that an organization which has to perform discretionary functions should be independent of ministerial control, it is organized as a commission in such a way that the executive has no control over the day to day functioning of the organization. In such cases the members are appointed for fixed term and can be removed from office only after following a set procedure. These commissions are useful for the entrustment of functions of a discretionary nature, Where independence of the organization from executive control is needed as in cases of staff selection, framing of delegated legislation, regulation of certain sectors of the economy, etc. Example of commission in the Government of India is the Union Public Service commission. Board and Commissions has it ‘s own obvious advantages but also need cautions like plural headship leads to confusion of responsibility. When a number of persons are responsible for a decision, none shoulders the responsibility, if something goes wrong. Everybody’s responsibility is nobody’s responsibility. This lead to negligence and inefficiency. The Board system of headship created weak executive and hence is not conductive to good and prompt work. It is time-consuming to take joint decision on matters which need immediate action. The system also leads to a lack of proper direction and control. When decisions are taken late, their execution is delayed further and even when steps have been taken to execute a decision, nobody puts his heart into it and therefore, the rank and file often find themselves in dismay when proper direction does not come forth from above in time. Indian Administration- Paper II "Syllabus Topic –Public Sector Undertakings: Impact of liberalization and privatization"
Q2. The impact of second generation reforms on management of CPSUs has been seminal. Explain.